Founded in 2003 EntroPay is an online service that provides users with virtual Visa cards. Their parent company Ixaris Systems is based in England, UK and is fully licensed by UK Financial Conduct Authority (FCA). This means that they are subject to the strict norms and regulations of FCA. The cards, that EntroPay offers, can be used in the same manner as regular plastic Visa cards to make payments and purchases online where the cards are accepted. These cards are funded by other conventional means such as credit card or bank transfer. The funds are immediately available and online gamblers can use them to play at once. The only principal difference between virtual Visa cards and regular ones is that the virtual cards do not exist in physical form. Otherwise they function in the exact same way. The cards are issued by the Anglo-Maltese Bank of Valletta. They are used to pay online or offline regardless of location. Similarly to normal cards they have an unique 16 digit code, an expiry date and a 3 digit CVV number. Unlike traditional credit cards these do not require a pre-existing credit score or credit worthiness and anyone can acquire one within minutes. Furthermore the user may create more than one Virtual Visa, should they wish. If a gambler plays on more than one betting site it would be easier for them to keep track of their money if they used a separate card for each site. A quality many people would appreciate about this card is the fact that it is not a credit, rather a debit card. This means that one cannot spend more than they have available at any time and no debt is accumulated. Cards are loaded first and used second. Withdrawing money from an EntroPay account back to a bank account could be a tricky and inconvenient process. The user must email Customer Support that they wish to transfer their funds and must pay the transfer fee of $6 / £3. There is no limitation on the amount one might transfer over to a bank account but they must have enough to pay the transfer fee. Opening an account is fast and simple. The system does not require any type of complex verification from the user. If you want to make use of this service, you simply need to visit their website where you will be provided with a form you need to fill in. To apply for a Virtual Visa the user only needs to supply their name, date of birth, country of residence and email address. The user also needs to come up with a username and a password for their EntroPay account. Following this the user has to put in the details to their credit or debit card to charge their Virtual Visa or alternatively use a Local Bank Transfer. After you have decided which of the options for topping up your card is most suitable for you, you simply need to make up your mind how much exactly you wish to transfer to your card. The funds will become immediately available and players can top up their betting accounts as soon as they complete the registration process. Still, they need to bear in mind that if they have decided to use a Local Bank Transfers to fund their card, they may need to wait up to 7 business days for the transfers to be processed. Depositing with EntroPay Virtual Visa is as simple as when using a normal credit card. On the cashier page choose the EntroPay payment method, fill out the form requesting your card number, name of card holder, expiry date and the CVV, then confirm the payment. The good news is that your funds will be transferred to your casino account right away, thus giving you the opportunity to start placing your bets immediately after you have confirmed the payment. Withdrawing is essentially the same process as depositing and just as easy. You need to go to the cashier page and choose to withdraw your winnings, select the sum you wish to cash out and choose EntroPay as the transaction method, then confirm the action and you are done. Once you have initiated the withdrawal, it will take some time prior to getting access to your funds. Still, you should not worry about this as you will be able to put your hands on your winnings within only a couple of business days. In most cases, cashouts take at least 2 working days, which is a relatively short period. EntroPay has a lot of fees, associated with its services, unlike a lot of their competition. Opening an account with them is free, but there seems to be a price tag for every other service they offer. Withdrawing money from an EntroPay account to a bank account costs $6 / €4,5 / £3 for every transaction. Loading an EntroPay card with a credit or debit card has a flat rate of 4,95% of the total sum. Still, this refers solely to topping up your EntroPay card via a credit or a debit card outside the territory of the EU. If you transfer your funds via your card within the EU, the flat rate will be 1%. If you have decided to top up your account via another EntroPay card you will need to pay £0.10, $0.20 or €0.15 respectively. While purchasing something in a foreign currency will cost you 2% more in favor to EntroPay. The billing currency conversion service, on the other hand, will cost you 2.75% of the total amount. Charging an EntroPay card from a personal bank account will set you back 3,95% of the total sum. The most important thing you should not forget is that you do not need to pay any additional fees to use your EntroPay card online. You will also have the chance to transfer funds from your EntroPay wallet to your card for free. Players need to pay a monthly dormancy fee of £2.5, $5 or €3.75 if their account has been inactive for more than 6 months. Still, claiming a payment to your EntroPay account will be free of charge. Withdrawing money to your credit or debit card will cost you £3, $6 or €4.5 respectively. If you are receiving money from your bank account, this will cost you 1.95% of the total amount. When you are withdrawing money to your bank account, you will need to pay from £1.49 to £7.99, from $2.99 to $14.99, or from €1.99 to €9.99. As you can see, the charges vary greatly due to the fact that they are determined by the currency as well as by the destination country. There are also funding limits to virtual cards and bank transfers. To their credit however, EntroPay has posted all of this and more in black and white on their website, so that consumers may judge for themselves whether they wish to pay all the fees related with this service. 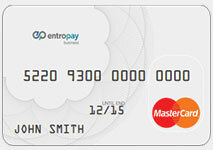 Since 2010 EntroPay also offers the issue of physical MasterCard cards, for use at vendor terminals and ATMs. Existing users can apply for these and be approved. After which a fee will be deducted from the default Virtual Visa card and physical MasterCard, along with the PIN for it, will be transported via mail within 3-4 business days. These cards are available in every country with the exceptions of some Middle Eastern and African countries that include Sudan, Democratic Republic of Congo, Belarus, Israel, Cuba, Iraq, Iran, Myanmar, Turkmenistan, Turkey, Liberia, Cote d’Ivoire, Nigeria, Syria, Pakistan, Democratic Republic of Congo, Zimbabwe, Uzbekistan, and Haiti. Users can charge these cards using their Virtual Visa or their traditional credit cards. The minimum sum a user can upload on their MasterCard is $20 and the maximum – $5000. As it was previously stated, EntroPay is a payment service that is regulated by the Financial Conduct Authority which is indicative of the fact that customers can use it with the peace of mind that their security is guaranteed. EntroPay boasts of a state-of-the-art security and firewall system. All data and correspondence between clients and EntroPay is encoded using 128-bit encryption software, making it unreadable to anyone who might be monitoring their systems. In addition to this, your card will be created by a cryptographic device that offers extremely high levels of security. Your personal information will be used solely when you are opening an account which promises that you will be provided with the utmost levels of both security and privacy. Still, if you find out that there are some fraudulent activities and the web-based casino you have chosen for your real-money bets may be compromised, you can be sure that all breaches will be contained. Additionally, you are given the chance to delete your EntroPay card right away, which will also protect you from frauds. EntroPay supports the most commonly used currencies including EUR, GBP, USD and more, 14 in total. They also offer what they call Dynamic Currency Conversion. This allows users to exchange foreign currency for a selected currency at competitive rates. Naturally these rates tend to fluctuate daily based on those at the foreign exchange market. For this service EntroPay applies a fee of 2% for each exchange. For customers looking for assistance EntroPay has an extensive selection of frequently asked questions, regarding verification and security, bank transfers, account management etc., posted on their website. This section covers a great deal of any issues or misunderstandings that may occur and it offers excellent explanations to their resolution. When it comes to client and service provider contact EntroPay is found wanting. The only means of communication they provide is via email. Although they claim to respond to all queries within a maximum of 48 hours, this is an inefficient method of correspondence when compared to live service chats or even a phone line. Clients wishing to speak with a person directly will be disappointed. Payments are secure and fast. With EntroPay playing the mediator between the gambler and the casino, none of the user’s personal or bank information is made available to the betting site. Security conscious players can remain anonymous for as long as they wish. The EntroPay card has one more advantage some players may also appreciate. Some gamblers may be delighted to find out that transactions carried out via this payment service will not appear on their bank account statement. Still, the deposit to your EntroPay card will be the only transfer of funds that will appear there. Furthermore the Virtual Visa in practice functions like a debit card, it does not let you spend money you do not already have. This way you are sure that you will not break the bank during your next session of blackjack. Considering the fact that you are allowed to set your own limits, you will have the chance to curb your expenses effortlessly, especially if you tend to spend money like water while placing your bets over the Internet. It is an undeniable advantage that EntroPay can be used for both transactions to and from the casino. Unlike some of the other payment services that are available out there, players can use EntroPay for loading cash into their casino account as well as when they want to retrieve their winnings which will provide them with greater convenience. Deposits via this payment service are instant which is also a great advantage especially for players who want to have the chance to start wagering right away. Still, withdrawals will take more time, but the period within which they are processed is not that prolonged in comparison with some of the other payment services. In most cases, your funds will appear in your EntroPay card within the next 2 or 3 business days. This payment service is preferred by such a large number of the gamblers due to the fact that in practice, it is available to everyone, irrespective of his/her credit history. This is the perfect alternative for you also if you reside in a country where you cannot make use of Visa cards. In fact, gamblers from 120 countries can make use of the payment service which explains why it is preferred by so many gamblers. These cards are widely accepted by casino operators and can be used by almost every player from all over the globe which provides gamblers with greater freedom and facilitates the transfer of funds over the Internet. One more advantage of EntroPay cards many gamblers will be happy to hear about is that they can have an unlimited number of virtual cards while they are using their account. Still, they need to know that they cannot have more than 10 active cards simultaneously. Gamblers can create new cards and delete the old ones with ease which further adds to the merits of the payment service. The fact that users can have more than a single EntroPay card will undoubtedly appeal to players who prefer wagering in more than one gambling websites. Thus, they will have the chance to employ a different card for each of the interactive casinos they have joined which on the other hand means that they will be able to keep track of their funds effortlessly. EntroPay offers a solid service with steep prices to boot. Overall this is EntroPay’s only drawback. Every time you load your card you forfeit 4,95% of the sum to EntroPay. When every button on their site costs you something you tend not to feel too good about it. Loading your card with a bank transfer cost 3,95% and withdrawing your casino earnings 1,95%. This is a business practice that some people will not come to terms with. Despite the fact that a large number of the interactive casinos have included EntroPay in the list of the supported payment solutions, there are still many casino operators that are unwilling to offer the payment service. That is why if you are bent on using your EntroPay card for loading cash into your casino account or for retrieving your winnings, you are advised to check in advance whether or not it is among the payment solutions on offer so that you could not get disappointed at the end. Even though gambling enthusiasts from a wide array of territories are enabled to make use of the payment service, there are many countries in which the service is not available. This is definitely a drawback, especially if your country of residence is included in the list of the countries where the service is unavailable. EntroPay’s service is a mixed bag of good and not so good. The anonymity and the secure nature of the transactions is excellent, no matter how protective of your data you are. When it comes to the Internet no one can be too safe. But when you take into account the fact that every transfer and exchange is being charged it really leaves a sour taste. EntroPay does indeed provide a solid service, but there are alternatives which come much cheaper.